I read somewhere that semolina pasta (the normal kind) cooked al dente is better for you than the average processed white flour staple. More in line with whole-wheat stuff. This is one nutrition claim I am ready to buy hook, line, and sinker. 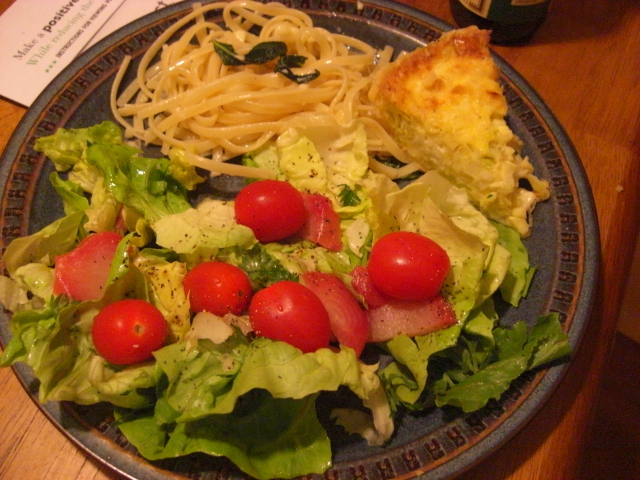 Al dente linguine with entirely too much local butter from grass-fed cows is health food! Hooray! 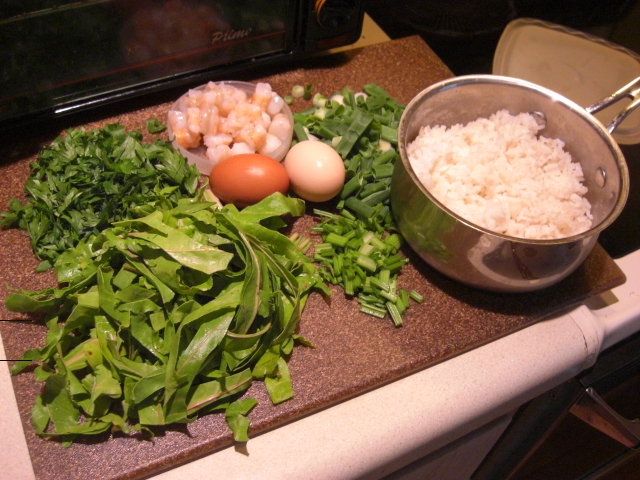 Yesterday I made fried rice with beet greens, par-cel leaves and stems, green onions, eggs, shrimp, and rice. 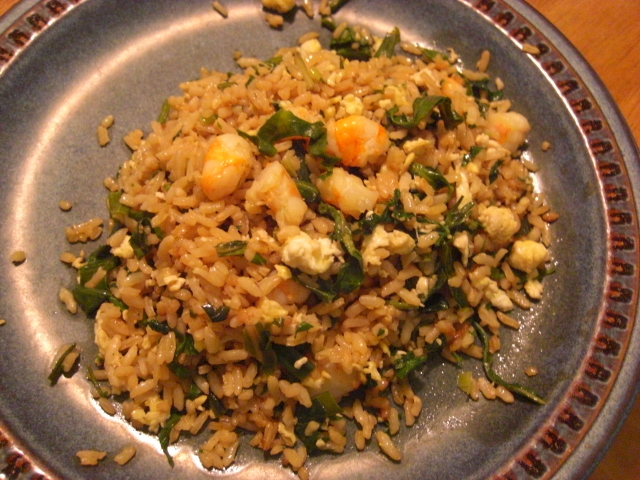 I used less rice this time but forgot to cut the peanut oil. So my fried rice is a little shiny this week. I’m going to freeze what’s left of the leek pie. We’ll see how that works. I’ve had three pots of tea with the lemon balm and sage. One more is steeping as I write this. The cabbage and one of the sweet potatoes have promised to hold the fort while we’re gone. Have a good week, everyone! I’ll be back 5/1. And I have the distinct feeling it’s going to be summer by then. 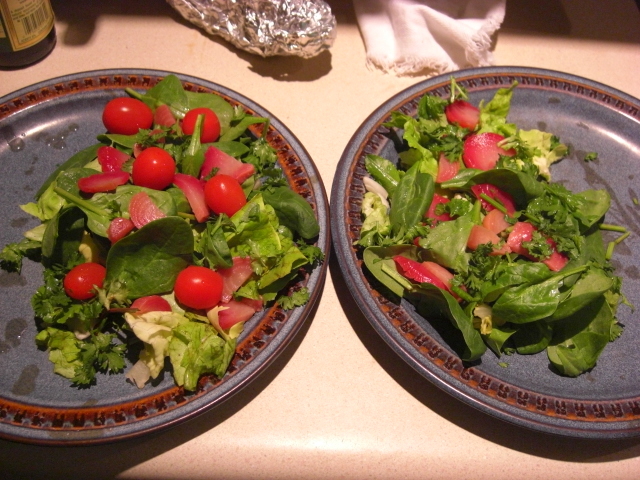 I am subscribing to your site so I can read about your adventures with your CSA. I joined a produce co-op myself back in January. I am just interested in reading about someone else’s experiences in this type of thing. Your blog has been so helpful for me! I think we’re part of the same CSA! ooh! and hope you had a good trip!